New Jersey medical malpractice attorney David A. Mazie of Mazie Slater Katz & Freeman recovers one of the largest Lasik malpractice settlements in US history for a 47-year old man rendered legally blind as a result of the surgical malpractice committed by famed eye physician Dr. Joseph Dello Russo. 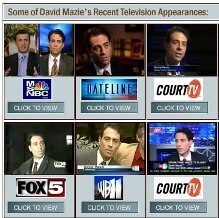 New Jersey medical malpractice lawyer David Mazie of Mazie Slater Katz & Freeman announces what is believed to be the largest settlement of a Lasik malpractice case in New Jersey history (and one of the largest Lasik malpractice settlements in the nation's history*) against famed eye physician Dr. Joseph Dello Russo and the New Jersey Eye Center. The $2.1 million settlement reached in Dell'Ermo v. New Jersey Eye Center and Joseph Dello Russo, M.D., Superior Court of New Jersey, Law Division, Bergen County, Docket No. : L-009074-01, is part of a group of 16 malpractice lawsuits filed against Dr. Dello Russo for negligently performing Lasik. This is the largest settlement of the group, and the only one in which the plaintiff would not agree to maintain confidentiality for the settlement. The claims were brought by James Dell'Ermo (47 years old) of Bedminster, New Jersey and his wife, Lisa relating to Dello Russo's malpractice in performing Lasik surgery which has rendered Mr. Dell'Ermo legally blind (vision worse than 20/400 without corrective lenses); with contact lenses Mr. Dell'Ermo only has vision of 20/50. Dr. Dello Russo's malpractice relates to his failure to recognize that Mr. Dell'Ermo was not a candidate for Lasik and that he had steep corneas. By performing Lasik on Mr. Dell'Ermo, Dr. Dello Russo caused a condition known as ectasia to occur in Mr. Dell'Ermo's eyes. Ectasia is a progressive condition which will ultimately require Mr. Dell'Ermo to require corneal transplants in both eyes. Dr. Dello Russo has promoted himself and his sons as "famous" eye surgeons, spending millions of dollars on radio and print advertising to promote their Lasik practice, and has continually maintained in the media that Lasik is a very simple and safe procedure, even performing Lasik live on Good Morning America. The Dell'Ermo case and its companion lawsuits are further evidence as to the questionable safety of Lasik procedures and the physicians who perform those procedures. In April 2008, the FDA conducted hearings and questioned the safety and effectiveness of Lasik. For further information about Lasik medical malpractice, please contact New Jersey medical malpractice attorney David A. Mazie. *Mazie Slater Katz & Freeman, LLC is aware of a handful of verdicts outside of New Jersey which exceed the amount of this $2.1 million Lasik malpractice settlement, however, it is our understanding that those verdicts were reversed and ultimately settled for significantly lesser sums.